The amp is for Hammond Suzuki Leslie 147A made before 2005. This factory new 147-style tube amplifier is a direct replacement for your vintage 147 Leslie amplifier. 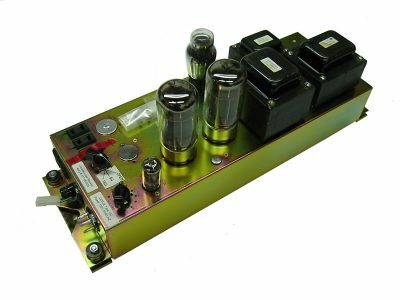 This chassis will mount in place of your old amplifier and only requires one connector to be rewired for the speakers. A quick way to determine if your Leslie is of this type is to examine the Leslie motors present in your Leslie. Vintage Leslies use two different motors to control the slow and fast speeds while newer Leslies only require one. This amp provides that classic 40-watt tube sound that Leslie is noted for. We recommend that a factory-trained technician install this part.